On the other hand, we humans slaughter some 70 million sharks annually primarily to supply a few affluent Chinese with a bowl of tasteless soup. Yes: the finning trade is estimated to be larger than the commercial shark-meat trade. Clarke et al. used trade auction records from Hong Kong to estimate that the total mass of sharks caught for the fin trade. Estimates ranged between 1.21 and 2.29 Mt (million metric tons) yr−1 with a median estimate of 1.70 Mt yr−1 in the year 2000. This amounted to more than four times the reported shark catch from FAO at that time . Estimating global shark mortality for the year 2000. Included are reported (from FAO) and illegal, unreported, and unregulated (IUU) landings as well as shark discards. 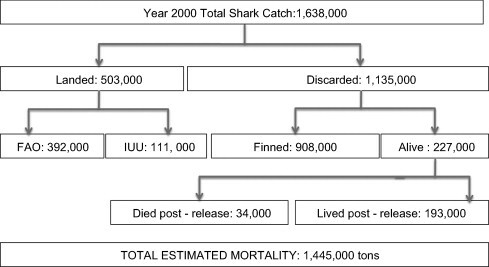 Total mortality was calculated as the total catch minus the number of sharks which survived discarding. All figures were rounded to nearest 1000 metric tons. Not the answer you're looking for? Browse other questions tagged nutrition china sharks .